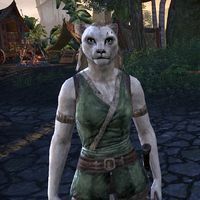 Elusara-la is a Khajiit who can be found in the Khajiit camp outside Elden Root. "Completely unaucceptable! If this is what Queen Ayrenn thinks of us, we should go back to Elsweyr!" "When we joined the Dominion, Queen Ayrenn promised to build us an embassy worthy of our stature. Today, these wagons are our embassy!" I could bring a message to the king. "Truly? Here, this letter outlines our grievances. If you would bring it to the king, we would be in your debt. Unless you wish to help pull termites from our "embassy"." "To go back on one's word is a serious thing. If Queen Ayrenn cannot construct an embassy, how can she build the Dominion?" Why don't you build your own embassy? "We can do this, of course. But this is about Queen Ayrenn's word. If she cannot get her people to aid us with a simple building, how can we trust them to support us on the field of battle? So we wait, and we see." This page was last modified on 12 April 2018, at 13:53.